That’s what this one makes me feel. Lalita, by The Love Language. Bouncing all over the house to this one. They don’t have a video yet but the link is for their myspace page. Click and listen to Lalita. 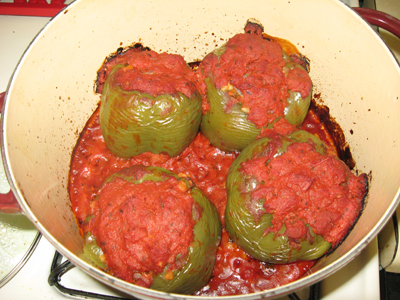 Easy to veganize because many traditional Turkish recipes don’t call for meat anyway. Someone asked me yesterday how the vegan thing was coming along and it reminded me that I hadn’t updated the blog in awhile. I am still mostly vegan, but ran into a problem when I kept getting canker sores. I haven’t had one of those in like 15 years, but within two months of being vegan I’d had two, each taking two freaking weeks to go away. Suspicious of the timing, I googled for a connection to veganism, and found lots of others have the same problem after giving up meat. And I asked a vegetarian friend and she said “Oh yeah I get those all the time.” Hm. All evidence is anecdotal but those things are so excruciatingly painful that it was worth it for me to add a bit of meat back into my diet to avoid it. About once a week I’m eating some fish or chicken and this is entirely unscientific but so far I’ve had no recurrence. Apparently canker sores are a bit of a scientific mystery and no one knows what causes them, but they suspect a B12 deficiency, B12 being found exclusively in animal products. So, that’s that. Still mostly vegan and definitely still no dairy, and the world would be a better place if everyone ate meat just once a week. Speaking of which, today I made a lovely bruschetta out of some campari tomatoes, garlic, olive oil, and some gorgeous-smelling fresh basil from my aerogarden. Yum. Using the Gentle Calm theme designed by Phu Ly. WordPress took 1.257 seconds to generate this XHTML page.